Well, I wanted a way of sharing my observations and reflections on various themes that mean something to me. I intend to write about anything that inspires me including my main interests and experiences in Tai Chi, writing and photography. And from time to time I will also post up short articles I have had published that I think may be of interest to you. The blog format is an easier way of achieving this as compared with the more structured writing formats that I have dabbled in such as screenwriting, plays, novels and business articles. It’s faster because I can write shorter pieces. The other reason for the blog is to raise my business profile as a facilitator and consultant – but rather than plaster my services and products all over the place, which can be very annoying, I figure if you are interested in what I write and you want to find out more about my professional life and our products then you can visit my Products page or our BJ Seminars International website. I was very young when I was born so rather than bore you with a long history of who this fellow Chris Bennett is, I will give you the abridged version, threaded by a theme that has been consistent in my personal and professional life. And that theme is people. I can speak with authority on this subject, as I am a person. A person who is fascinated in the way people behave and the reasons why they behave in the way they do. This fascination with people has drawn me into diverse experiences that have motivated me to understand other people and myself better. For example in one of my lives (no, I am not regressing) I was a basketball coach for 15 years. I coached both junior and senior domestic and championship basketball here in Melbourne, Australia. And Coaching is one endeavour where you can experience the full gamut of human emotions in a forty-minute game; joy, anger, fear, frustration, excitement, sadness, elation, etc. Coaching also teaches you about motivation, teamwork, communication, interpersonal skills, patience, organising, leadership, performance improvement, adapting to change; all skills that I now use and teach with Sue James in our BJ Seminars International programmes. A while ago I decided to do what most people would never attempt. Stand Up comedy. Well, I’ve been facilitating, training and coaching for over 30 years and felt the need to do something that’s out of my comfort zone. So why not Stand Up comedy? I use the stage name of Chris Bee because there already is a professional comedian called Chris Bennett and I am strictly an amateur. I reckon I’m pretty good. If you disregard the lack of talent, material and timing! My stand up is just a hobby and when I feel the need to embarrass myself I book a gig. About 30 years ago a friend of mine suggested I try Tai Chi. It took him two years to convince me to have a go. 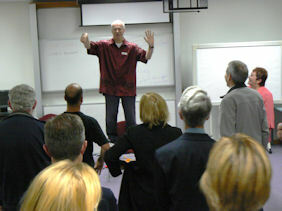 I went to my first session in Blackburn (Melbourne) and one hour later I was hooked for life. It’s a great addiction because of its uniqueness and its depth in the areas of health and wellbeing. And it even landed me a role on a Channel 31 television series called ‘Bad Habits’! A role I was born to play because I had to play myself; a Tai Chi teacher. The half hour episode involved a group of workers who were at a health retreat, and my role was to show them how to energise and reduce their stress with Tai Chi. Unfortunately the television offers have not come flooding in, but I did have fun jumping around cameras, directors and cast members in a very small room. Another hobby of mine is juggling, which is great fun. They say when you drop a ball you’re improving. If that’s true, then by now I’m an expert! In my spare time, just for fun, I’m currently writing a memoir and two of my many other projects include a screenplay and a street photography book. Hope you caught a glimpse of who this fellow Chris Bennett is.